Put your mind at ease as you make your way down the picture-perfect streets of the Jordaan neighborhood, on the west side of Amsterdam. Bikers, tourists, and coffeehouses line the sidewalks, and the canals beckon nearby, ideal spots for memorable photos. Take a second and stop inside one of these bars for an ice-cold Belgian ale or a locally brewed Dutch beer. Mellow, relaxed, yet surprisingly filled with youthful locals, De Tuin is a popular Jordaan brown bar. With comfortable music and a friendly staff, De Tuin is charming and possesses a welcoming feel. With a wide collection of Belgian and Dutch brews, De Tuin makes an enticing pick for an all-day or nightlong stay. Grab a seat on the patio, kick back to the musical selections of De Tuin, and enjoy people-watching under the crisp Amsterdam sky. Located directly left of Fraîche, a delectable breakfast and brunch favorite on Westerstraat, Café de Parel is nestled a few feet away, with a minuscule patio and a mix of different colored chairs. Step inside and enjoy the cozy seating by the windows, a full bar with several taps, and a well developed drink selection. Play some board games and have a drink at this small yet well-known Jordaan bar. With packed weekend crowds and a robust reputation as an Amsterdam classic bar, De Twee Zwaantjes sits next to the canal on picturesque Prinsengracht Street. Closed on Wednesdays, but in full swing every other day of the week, this homey bar is often host to hearty sing-alongs among its guests. Beer and simple snacks are to be the expected orders here, but it is nearly impossible to guess who you’ll be seated next to; this bar is overflowing with the friendly faces of Jordaan locals. Fun fact – the bar’s name means ‘two swans’ in English. If searching for a more elegant establishment, set off towards Vesper Bar. Their location on Vinkenstraat has become a Jordaan hub for craft cocktails and a elegant night out. The bar is dimly lit, intimate, and well furnished. It also features a trendy chalkboard that showcases the specials of the night. 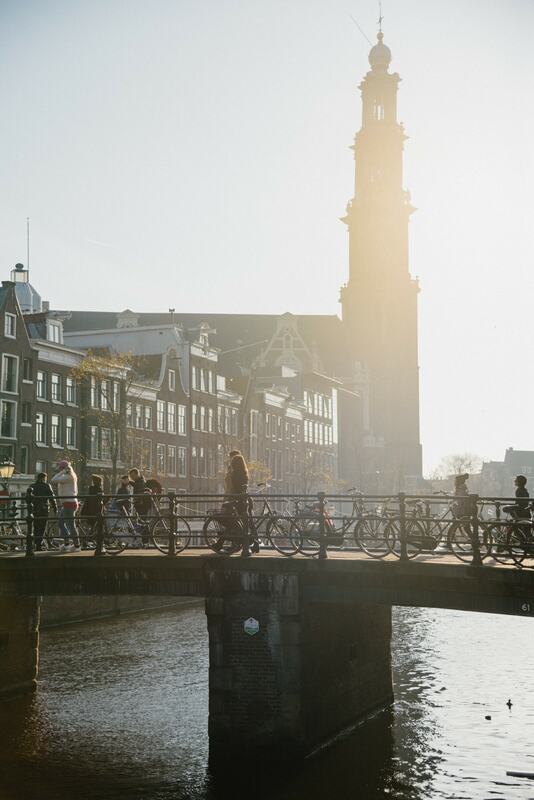 Vesper is also quite close to Amsterdam’s Haarlemmerdijk shopping district; the Brouwersgracht is also walking distance – and is commonly hailed as one of the most beautiful streets in the esteemed city. This traditional Amsterdam pub is a cozy neighborhood haven for those looking to enjoy foamy Belgian beers and excellent appetizers. Try a slice of apple cake, a freshly brewed cappuccino, or even a glass of wine. Its waterfront terrace extends a few feet out onto the canal, and the charming bar lined with brass tap spouts, is lit by a mock candle chandelier. Also situated next to a canal, Papeneiland occupies a beautiful building dating back to the 17th century, boasting quite the elaborate façade. A corner brown cafe, Papeneiland is one of Amsterdam’s oldest spots at which passersby may stop for a tall mug of ale. Braving the past few centuries, the building continues to stand on one of the busiest corners in the pleasant Jordaan neighborhood.